If you stand on your head, the Buffalo Sabres are No. 1. But if you prefer to read the NHL standings in a more upright manner, the Sabres are at the bottom – again. Buffalo became the first team ever to finish 31st in the overall standings (remember that Vegas entered the league this season) by virtue of a 4-2 loss to the Ottawa Senators on Wednesday night. The Sabres’ record sank to 25-43-13 for 62 points, and they can no longer catch the Senators. Want more? Buffalo has finished last overall three times in the past five seasons. You have to go back to the Senators of the mid-1990s to find a team that has done that, and they had the excuse of being an expansion team. The last non-expansion team to do it was the Quebec Nordiques (three straight from 1988-89 through 1990-91). “We expected a lot of this team, but it comes down to doing it,” Ryan O’Reilly said. History won’t be kind to this Sabres team, which came into this season optimistic that it had a chance at the playoffs. Part of that came from the fact that a new general manager and new coach were put in place. Instead, Buffalo got off to a terrible start and never threatened to be a factor in the postseason race. “Those times we faced adversity, we never recovered from it,” coach Phil Housley said. “Maybe being young and being banged up didn’t help, but we didn’t overcome that adversity. Wednesday’s loss to the Senators was rather typical of the season, mostly because it was at home. Buffalo only won 11 home games this season, which tied a franchise low in the category set by the second-year team of 1971-72. When you considered that ties aren’t part of the equation anymore and it’s in theory easier to earn wins, this Sabre team might go down as the worst ever in terms of play in its own building. So much for home-ice advantage – 11-25-5 just won’t get it done. “It’s been disappointing,” Kyle Okposo said. “This has got to be a place where teams are scared to come in and play in our building. We have to dominate them, and we were a long ways from that this year. 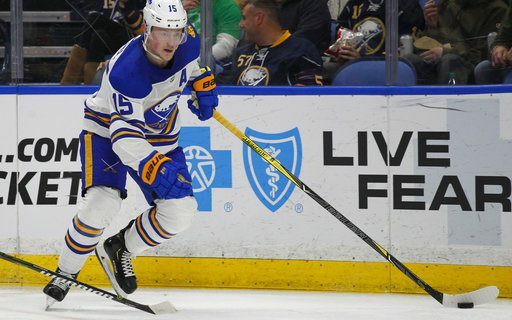 The Sabres had a near-sellout crowd behind them at the start on Wednesday, armed with Dominik Hasek bobbleheads and ready to take advantage of sales on items in the concession and souvenir stands. Buffalo couldn’t have asked for a better start, as O’Reilly capitalized on a breakaway with a nifty move to score only 30 seconds in. Those good feelings lasted less than three minutes, when Max McCormick got the goal back. Ottawa’s Matt Duchene capitalized on a quirky bounce less than four minutes after that, and the Senators had the lead for good. Once the Senators took a two-goal lead, they did a good job of preventing too many chances. Kyle Okposo got Buffalo within one late in the second period, but that was as good as it good. An empty-netter sealed the Sabres’ fate. Sadly for Buffalo, a last-place finish doesn’t mean what it used to mean – a guaranteed top draft choice. The Sabres will have to go through the draft lottery, and they will have a less than 20 percent chance to getting the first pick – expected to be Rasmus Dahlin of Sweden. They will go no later than fourth. Buffalo will have two more chances to pad its road record – a more respectable 14-18-7 – with games in Tampa Bay and Florida this weekend. Then it’s back for the locker cleanout session. It’s also a time for a last-place team to say goodbye to each other – because some of these guys certainly won’t be back here next season.